Low-impact exercise is optimal for people with osteoarthritis. Essentially, low-impact exercise refers to types of exercise (such as swimming, walking and bicycling) that are less stressful to weight-bearing joints, especially the spine, hips, feet, knees, and ankles. Running and jogging, however, are examples of high-impact exercise. Bicycling is a great exercise option for people with osteoarthritis. A regular routine of bicycling keeps your knees moving through their range of motion and, at the same time, strengthens the muscles that support your knees. It makes sense to continue bicycling for as long as you are able. However, if you have a significant amount of joint damage in your knees or hips, your ability to ride a bicycle may become increasingly limited. A February 2010 study in Disability and Rehabilitation assessed cycling in three groups — knee osteoarthritis patients, knee replacement patients and patients who had meniscal or ligament injury. Results showed that as a patient aged, the ability to continue cycling decreases 5% each year. The chance of continuing cycling is 1.98 times greater for men than for women. The chance of experiencing pain while cycling increases by 8% with each unit rise of body mass index. This study attributed increased pain during cycling to body mass index, rather than to a patient's diagnosis. 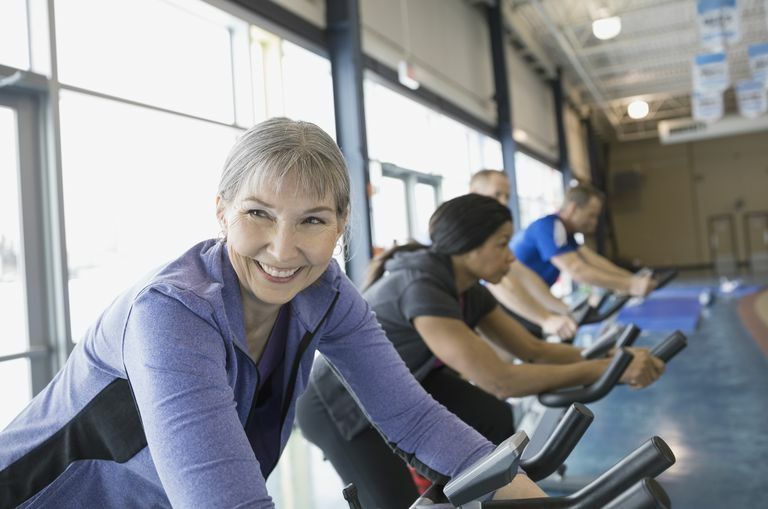 Another interesting study, published in the Journal of Gerontology, compared high-intensity cycling to low-intensity cycling in knee osteoarthritis patients. Researchers concluded that low-intensity cycling was as effective as high-intensity cycling for improving the patient's function, gait, aerobic capacity, as well as for decreasing pain. That said, rather than giving up bicycling when it becomes increasingly difficult, look to adapt the activity to your needs. If bicycling outdoors is a problem because of uneven ground, steep hills and other challenges that come with the great outdoors, bring bicycling indoors. For outdoor bicycling, be sure you have a bike that feels comfortable. Some people advise having a range of gears. There are also bicyclists who recommend Granny gears (small chain wheel on a triple crankset). Granny gears allow for spinning at a high rate of revolutions per minute. The Granny gear is so-named because, theoretically, even a granny can climb hills in this gear. If your physical limitations (painful joints, joint deformity, balance problems) make it necessary to bring bicycling indoors, consider the options of an upright stationary bike or a recumbent stationary bike. A stationary bicycle is a bike used for exercise rather than for transportation. It is equipped with handles, pedals, and a typical bicycle seat, but it's built on a stationary platform. If such a bike has wheels, they are raised from the ground. The design closely mirrors outdoor bicycles. Some stationary bicycles have an ergometer to measure the work you've done while pedaling. A recumbent stationary bicycle is equipped with a larger, chair-like seat. A person riding a recumbent bike sits back and rests his or her spine. The pedals on a recumbent bicycle are typically located toward the front, and hand-grips are in a position that requires less reaching. It's a more comfortable experience. but some experts question if exercising on a recumbent stationary bicycle provides as many benefits as exercising on an upright stationary bike. However, for people with osteoarthritis, a recumbent stationary bike may make the difference between exercising and not exercising. Before becoming active in bicycling or any type of exercise, you should talk to your doctor. When he or she gives you approval, consider your different bicycling options. The goal is to make bicycling an activity you will enjoy and stick with so that you can reap the many benefits. Choose your equipment carefully. And remember, pace yourself when riding! All About Osteoarthritis. Nancy E. Lane MD and Daniel J. Wallace MD. 2002. Oxford University Press. The effects of high-intensity and low-intensity cycle ergometry in older adults with knee osteoarthritis. Mangione KK et al. April 1999. The Journals of Gerontology Series A Medical Sciences and Biological Sciences. The important predictors of cycling use in three groups of knee patients. Disability Rehabilitation. Breujem SJ et al. Feb 10, 2011. Osteoarthritis and the Descent into Granny Gears. IsolateCyclist. January 7, 2011.